Torus mandibularis, also termed as mandibular torus, is basically a sublingual protuberance on the mandible lingual side It can be in the form of a benign bony growth on this area. The most common area where they found near the bicuspid and tricuspid teeth and superior to the mylohyoid muscle, a paired muscle for mandibular attachment. Mostly they are more than one and mandibular tori is used to represent the plural occurrence. In most cases they are usually asymptomatic but in some cases, patients usually complain of pain with denture placement or even when food is lodged against the lesions. These body growths are covered in the typical oral mucosal layers. Such growths can occur as single or multiple growths having a length of 2mm and diameter of 3 to 4cm. The growth size of these lesions is variable and could be different in different individuals. In some cases, the masses can grow large enough toward midline of the mouth. It is composed of closed-pack, lamellar bone with a repeating compact concentric form, filled with scattered osteocytes. Tori can be easily confused with other kinds of bone proliferating soft tissue lesions. In order to differentiate it, diagnosis should cover presence of abscess, peripheral ossifying fibroma, vascular neoplasms, salivary gland malignancy, and bone cancer. There are some kinds of this growth which are more common in male members of population, while some other types are mostly found in females. For instance, lesions are predominant among males between the fourth to the fifth decade of life. Another variation, termed as Torus palatinus, is more usual to the female population. It usually occurs in adults and very rare in children. Read to know about Torus Mandibularis, its possible causes, possibilities to remove and resulting cost. If someone say to you that exactly this thing is actually the cause of Torus Mandibularis, don’t believe since the direct cause of torus mandibularis is still unknown. There are several factors which are believed to contribute to its occurrence but to tell what should be avoided is not possible. , Like many unnecessary growths, Torus Mandibularis is also genetically predisposed with autosomal dominant pattern which is more common among Inuits and Asians, particularly Koreans. Another possible reason of its occurrence is mandibular arch torqueing and mandibular occlusal pressure. The pressure against the periodontal ligament due to factors like bruxism or teeth grinding and mastication pressure related to consumption of coarse food adding stress to the bicuspids. Which in turn could lead to abnormal bone formation at the lingual area. 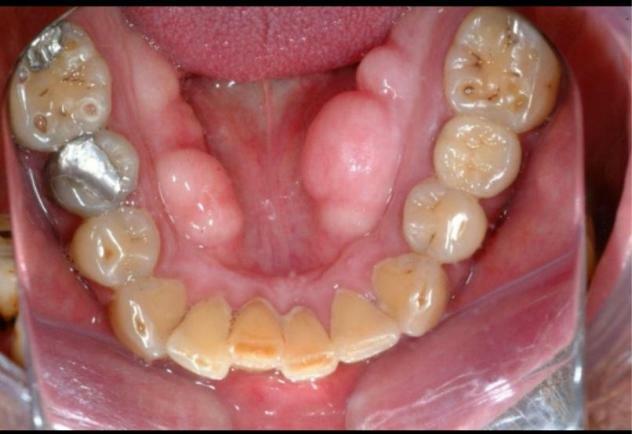 As there are not any harm associated with these lesions, that’s why it is usually unnecessary to remove mandibular tori. Removal meight be recommended if the lesions are large enough to interfere with oral functions such as dental placement, dental procedures, and mastication impairment. In order to remove these lesions, usually surgery is performed. Mallet and chisel surgical removal are most common. This procedure involves burring or saw technique which is considered effective to reduce or even eliminate the body growth. This surgery requires induction of general anesthesia and involves chiseling off the tori cortex or cutting through the base of the mass through a burring procedure. In addition to traditional surgery, laser surgery to remove this kind of growths is also popular. Although it can cost a little more than the traditional one, but one sure fact is that laser surgery has certain advantages, such as the accuracy of the cut and the absence of vibrations and hand pressure during use. Lasers also have clinical benefits, such as less bacterial infection of the surgical area and increased levels of oral comfort. Minimal bleeding, inflammation, and infection are some common post treatment complications. Around 3 to 4 weeks are required to have a full recovery. Although there are pretty high chances of recurrence of such growth even after complete removal but it has no potential for malignancy transformation. It is an ongoing process in the bone development of the mouth rather than a onetime condition. Sometimes the growths only appear as small bumps while at times, they can grow so large to be able to touch one another.